Once is the second book in the EVE trilogy. Just like with Eve, Once had me hooked from the very beginning. So many things happen in this book but I'll try to avoid any spoilers. Eve has been living in Califia for 3 months. She is desperately missing Caleb and doesn't feel like she quite fits in with the other women in the camp. After hearing rumors that Caleb is injured and in an abandoned warehouse ouside Califia, Eve sets off to rescue him. It was all a trap of course and she is captured and taken to the City of Sand. When she meets the King he is not at all what Eve or I had expected. I'll just leave it at that. I loved the City of Sand. The way the author details everything makes you feel like you are right there with Eve. This book has a bit more romance in it than the first. I don't usually care for alot of mushy, kissy-kissy romance scenes but I found myself not minding when it came to Eve and Caleb stealing moments together whenever they had a chance. 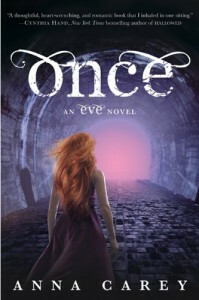 Once is fast-paced, engrossing, and full of twists! You'll want to read it in one sitting. Just as you start to think you might put this book down and get some much needed sleep...BAM! Another plot twist. I will warn you though- have the next book, Rise, ready. Once leaves you with a huge cliffhanger. It will shatter your soul and have you cursing the author for leaving you broken and emotionally damaged. I recommend this book for anyone that loves dystopian, post-apocalyptic or YA books. And, of course, if you've read and enjoyed the first book.